My sister called to tell me she had some family news: Joe the Barber died. This takes some explaining. Although I don’t remember it, family history is that Joe gave me my very first haircut. Not only that, he was the barber for my grandfather and father and gave my older son his very first haircut as well. That’s four generations of us. His shop was almost directly across the street from PS 90 where I spent my grammar school years from kindergarten to 8th grade, the Jamaica Avenue elevator line rumbling overhead nearby. My Uncle Phil lived in the same house where my father grew up, directly across from the school and a leisurely stroll to Joe’s shop. Joe cut Uncle Phil's hair as well. When I was old enough to take my Schwin to school, I’d park the bike in Uncle Phil’s garage. Every few weeks or so I’d show up at Joe’s for my regular haircut, a buzz cut by the time I was biking to school. Joe had a couple of chairs in his shop, but he was the only barber and there would usually be a wait, so I was able to get my hands on a few adult magazines while I waited and he chatted with the customer in the chair. I looked forward to my turn as he always treated me like a kindly uncle would, knowing everyone in our family, asking me about family news, how things were in school, talking about my Dad which gave me perspective on him I would not otherwise have seen. He’d also talk about my grandfather, who by then was deceased, so Joe the Barber was an endless source of family history and gossip and advice. Joe was Italian and proud of it. He was also a handsome man, always smiling while working, frequently humming a song, often joking that he could become the next Perry Como! When I was in high school, preparing to go off to college, his own son was going through a rebellious stage, racing his Impala around, getting into a little trouble and naturally Joe was concerned. Unknown to Joe, I was doing the same kind of adolescent stuff and it was my turn to comfort him, telling him not to worry. Once I went off to college and got married, I had to find my own barber in Brooklyn, although when I visited my parents in the home where I grew up, I still managed to stop in for a quick haircut with Joe the Barber in the same shop he had been in for decades. As usual, he talked about my family and in particular about my Aunt Lillian, who would later leave her husband, Uncle Lou. After Joe’s wife died, Joe the Barber married Aunt Lillian, but even my Aunt did not refer to him as our “Uncle” Joe, signing Xmas cards, “Aunt Lillian and Joe.” But, to me, the man who just died, nearing the age of 99, was my dear Uncle Joe, who was part of the family all my life. 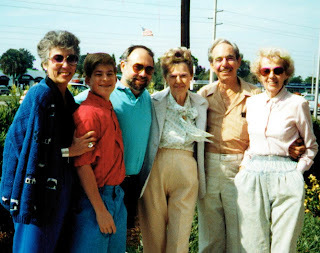 Here we are with my Aunt Ruth, Uncle Joe, and Aunt Lillian more than twenty years ago.